I'm not sure who gets more excited about these chocolate ripple cakes more: me about making them, or my family about consuming them. Either way, this mutual excitement makes the process even better. 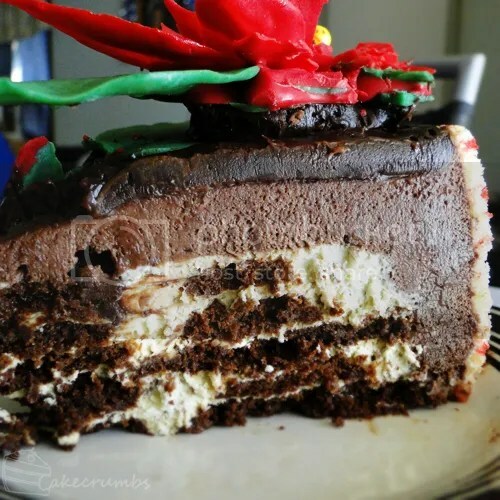 Chocolate ripple cake has such a welcome place on the Australian Christmas dessert table. It's also something that's quick and easy to make and a process I'm familiar with. It's ideal when made a day in advance and needs no finishing touches before serving. That made it a perfect candidate for our Christmas feast. This cake was one of the two main desserts I made for Christmas, alongside the macarons and pudding truffles for nibbles. 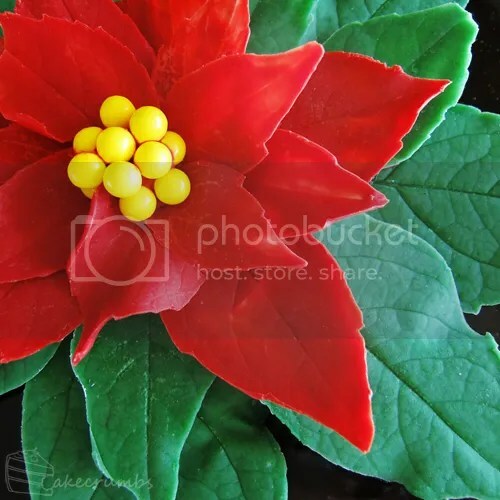 This version featured the familiar chocolate poinsettia on top, but I gave the joconde sponge a little twist. This time I wanted to try something a little different with the exterior. Rather than patterning it with a decorating comb to make stripes, I wanted something a little more festive. I didn't have any specifically festive stencils on hand, so I opted for this swirly pattern as being the next best thing. I actually had a bit of trouble with making the joconde sponge this time. I'm not entirely sure what I did wrong. I was having one of those moment in the kitchen I periodically have where I get too comfortable with a process and things go wrong. I had massive amounts of drama with the chocolate leaves as well. That I think was mostly the humidity, but some carelessness on my part. After a day the chocolate had still not set, so I had no choice to put them in the fridge. I dislike doing that, as it dulls the chocolate and can make it sweat later, but it was a better option than broken leaves. In the end we got there. It lacked the finesse of previous versions, but the stencilling was fun to try out. I don't think I liked having so much white on the joconde. Maybe next time I'll make the patterns white and the sponge coloured. Lots of things to try next time. Inside we have a choc-peppermint ripple cake, covered in chocolate mousse. I made the ripple cake a little shorter this time to give a more even covering of mousse. 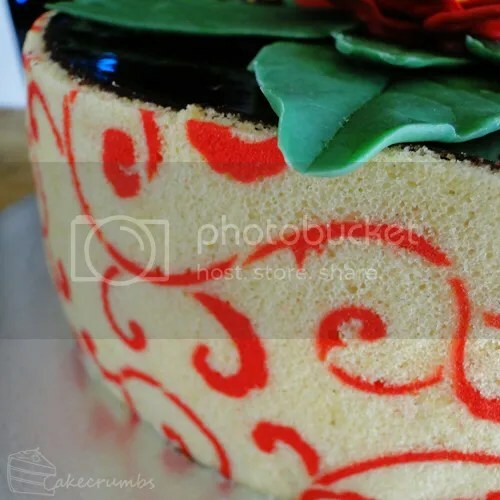 This is topped with the layer of ganache and white chocolate flowers. For this cake I used the recipe as seen in the miniature version of these cakes. 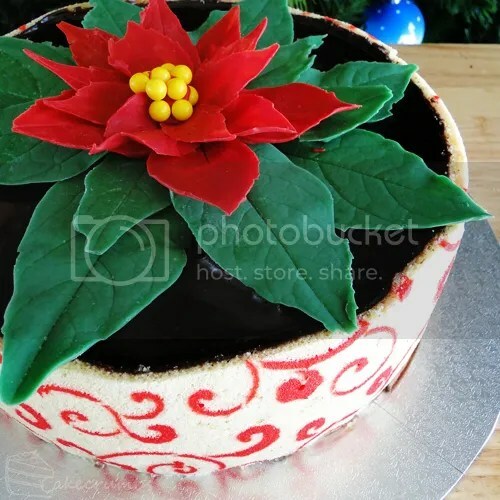 The only difference is that instead of assembling them as 4 individual cakes, you line one springform tin and make one large ripple cake for the centre. If you need assembly directions, they're identical to this version of the joconde. I think the leaves still looked great, even though you had to put them in the fridge. You always create amazing looking ripple cakes.